One of the many popular things to do at the Bridgeview Bed & Breakfast is sit outside and watch all the birds and wildlife that surround our establishment. You never know what you are going to see! We have seen so many birds, ranging from Baltimore Orioles, Gold Finches, Night & Great Egrets, to a few Bald Eagle sightings! Refer to the link on Bird Watching in PA for a list of birds and their favorite nesting places. Being directly on the Susquehanna River, you get to enjoy all the river wildlife first hand. Bring your cameras and be ready for some great bird & animal photographs!! Call or click today for rates and reservations!! 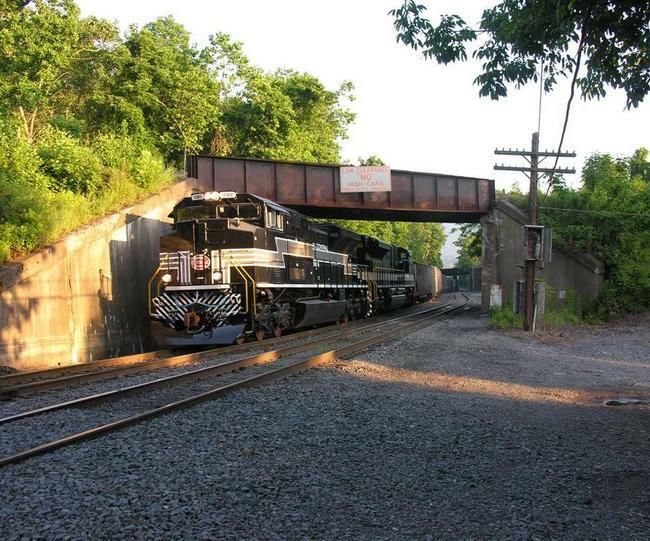 Two Norfolk Southern Heritage Units!! Not since the Penn Central merger has a New York Central Loco come into Enola Yard. Team it up with a Savannah & Atlanta Loco and what do you have? Science Fiction? No, the Norfolk Southern Heritage Program!! Thanks NS!! These days are exciting for Railfans, because you never know what may come next. Come enjoy a piece of Pennsylvania history and Norfolk Southern Heritage while staying at the Bridgeview Bed & Breakfast. We offer clean, cozy rooms with private baths. Competitive prices and week day rates make Bridgeview Bed & Breakfast an affordable "home away from home" for your next get a way!! Call or visit our website today for room by room tours, rates, and reservations. Make it a weekend of train rides and Rail Road Museums!! Pennsylvania is home to some of America's most famous railways. It is also home to the nation's oldest railroad, the Strasburg Rail Road. There are many train museums and historical sites, many rail roads still offer train rides or steam train rides. 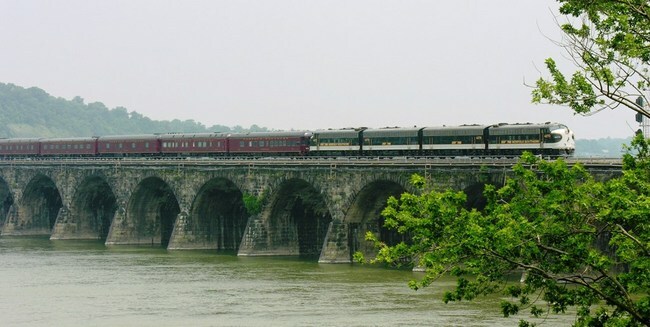 Some of the scheduled train rides, scenic tours and museum schedules can be found at www.scenicrailexcursions.com/pennsylvania_trainrides Pennsylvania is also home to the infamous Rockville Bridge. The best place to see a train cross the bridge is from the deck of the Bridgeview Bed & Breakfast. 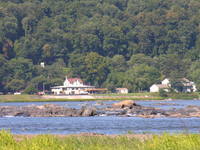 With so many great places to visit within driving distance, Bridgeview Bed & Breakfast. is your perfect lodging choice for a week or weekend of train excursions. Some of the closer places are the Harris Tower, Lehigh Gorge Scenic Rail Ray, Middletown and Hummelstown Railroad, Williams Grove Historical Steam Engine Association and the Railroad Museum of Pennsylvania. Make Bridgeview Bed & Breakfast. your lodging choice. We offer clean, comfortable rooms with private baths, high speed internet and continental breakfasts. There's a beautiful wrap around deck overlooking the river, Blue Mountain and Rockville Bridge, a sitting room with big picture windows for those rainy days. With competitive rates, Bridgeview Bed & Breakfast. is your best lodging choice in central PA. The Norfolk Southern Office Car Special Returns!! The Norfolk Southern OCS train returned heading west today. The theatre car was packed! It is a remarkable sight to see all the trains that use Rockville Bridge on a daily basis. For Railfans, it's amazing, because you never know what may come next. Come enjoy a piece of Pennsylvania history while staying at the Bridgeview Bed & Breakfast. We offer clean, cozy rooms with private baths. Competitive prices and week day rates make Bridgeview Bed & Breakfast an affordable "home away from home" for your next get a way!! Call or visit our website today for room by room tours, rates, and reservations.